I am so happy to be here sharing something REALLY near and dear to my heart! I teamed up with Friday Apparel to spread their message #loveyourself! In a world of comparison, mom guilt, loneliness, stress & down right struggle it's often hard to stay above it all! Self care is ALL the rage right now. What does self care mean to you? I recently answered some question about this KILLER campaign with my shop Friday Babes & I wanted to share what I had to say about it here because I REALLY believe when we love ourselves there is NOTHING we can't accomplish!! I have ABSOLUTELY struggled with loving myself. I am inherently a confident person, but I am a human, and I have insecurities. There have been times in my life where those insecurities have been magnified with my life situation & I chose to let the doubt & struggle creep in. I was a single mom for a time and it was the hardest & most growing time for me. I had a lot of self doubt, I treated my body poorly by neglecting it's needs, and felt immense pressure to be someone I didn't feel worthy of being, a mom. What got me out of my struggle was finding who I was, aside from a mom. Finding MY interests, using MY talents & helping others find theirs. By being my truest self & serving others I was able to find REAL love again! Hi, I'm Miss Tara Brooke, Content creator, podcaster, stylist, wife & Momma of 2! I am a believer in being better tomorrow than you were today & strive to leave people better than when I found them! I am a strong believer in loving yourself! I think the best way to love yourself is to get to know yourself! Often times we get so caught up with wanting to find someone to love us, that we miss out on learning to love ourselves! The greatest love we can give ourselves is permission to BE our truest selves, but to be THAT self, we've gotta find that self first! 3. How has becoming a mom affected your self love, and how do you want your children to view themselves as they grow up? I have been blessed with both a daughter & a son. My daughter has this pure & true confidence that she exudes in everything she does & my son, even at 3 months has a spirit about him that is so loving and kind. They are just learning who they are & they have these traits that will serve them in their lives, it helps me to look at myself & to search for those qualities I naturally possess to better my relationship with myself. I hope I can help them cultivate the goodness in them & help them build relationships with themselves to encourage them to love who they inherently are. 4. We are big fans of Instagram, but it can be hard to not get caught up in the ‘comparison game’ and stay positive while scrolling through what seems like “Instagram perfection.” How do you love yourself, your life and stay real while being part of the Instagram world? I like to keep it real on instagram, both through what I share on my feed & through the people I follow. If I am ever feeling a slight struggle with comparison I will give myself a social media time out. I put the phone down & enjoy MY life in MY world & it helps me realize what I have IS enough. I am a busy body & I go crazy if I don't leave the house daily! If you know me, you know I am a FAN of Sodalicious (a local soda drive thru), If you know me you ALREADY KNOW... I treat myself to a Soda everyday. Yes, I enjoy soda, but I also enjoy a little break in my day, with or without my kids! I also enjoy a good Netflix bath. When I am feeling too much life I will lock myself in the bathroom with my laptop, prop it up on the counter & enjoy my favorite show in a nice warm bubble bath! 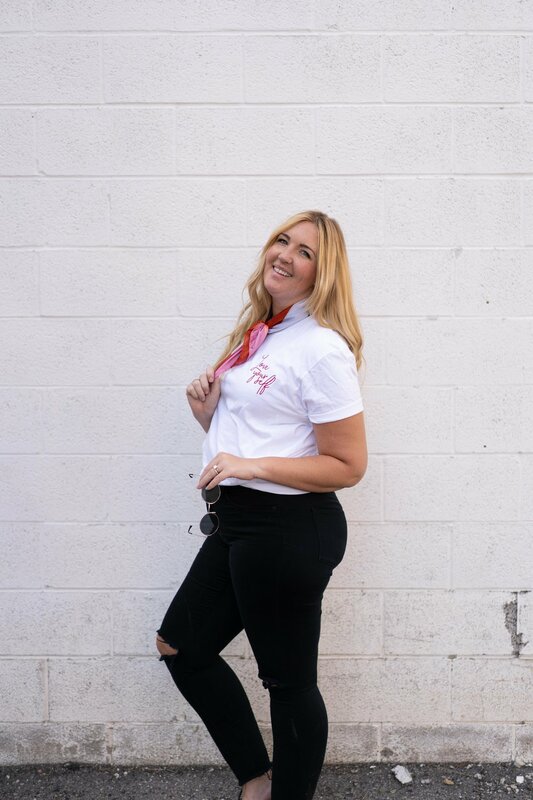 Join in on the #loveyourself movement and share what loving yourself means to YOU over on instagram & make sure to tag me (mstarabrooke) and @shopfridayapparel AND of course hashtag with #loveyourself so we can SHARE THE LOVE!! And snag a Love Yourself tee from Friday Apparel for 20% off with code "TARA" UNTIL SEPTEMBER 2ND!